Will expected UCIS promotion ban leave too many gaps in the regulations to protect investors? It should have been April. Now it will probably be June. But despite the two month timetable slippage reported here on trade website Money Marketing, the new regulator Financial Conduct Authority is set to announce its first ban sometime next month. Financial journalist Tony Levene gives his own strongly-worded analysis below. That will bring the long-heralded clampdown on UCIS. These are the unregulated collective investment schemes that increasingly feature in both the investment and, especially, the pension planning of the bold as well as the list of shame of the bust. But anyone who expects investors to be one hundred per cent protected from some of the riskiest investments on offer, might just as well wish for the moon. For the new rules will not prevent gullible investors from buying – it will only stop recognised financial advisers from “promoting” (regulator speak for selling) these vehicles. And any formal ban will take at least a year to put into place, allowing some advisers to make a last chance push onto clients. Collective investment schemes pool the money of many investors to give them the clout of a huge player. They have been around for a century and a half in the guise of investment trusts, unit trusts, life insurance policies, money funds and property funds. They have been the mainstay of most people’s pensions and other savings – only a small minority have opted for individual stock holdings. The vast majority of these plans are regulated by the watchdog – now the FCA whose rulebook controls investment powers, and how they are run, although not returns or charges. And if specific criteria are met, overseas funds are also recognised within the UK. A significant minority of funds do not fit that regulation. These are UCIS. UCIS use has dramatically increased over the past few years as previous rules on what could be included in a Self Invested Personal Pension (SIPP) were lifted to offer what many would say is effectively a free-for-all. Schemes once considered beyond the rules could be sold to investors as “SIPP compliant”. Often complex, these schemes go beyond shares, bonds, commercial property and cash to more exotic areas such as foreign forest plantations, film production plans (often sold more for tax purposes than their chances of artistic success though some have fallen foul of the Revenue), wine, overseas property and bio-fuel schemes on the promise of higher returns or diversification. But while promoters stressed gains, they generally spent less effort on discussing the risks. Many investments are illiquid – some may take a year or more to return money when holders wish to cash out. And a significant number have seen client cash evaporate. There should be a balance between the freedom to promote and the need to protect vulnerable consumers. With UCIS, the current position is that they are not to be promoted – a definition that includes marketing literature, emails, websites, phone calls, social media – by advisers to the general public except to certain exemptions. Certified high net worth individuals, and self-certified sophisticated investors. The definitions are difficult to find but easy to fulfil once discovered.|One self-certified sophisticated investor compliance form states someone who has made more than one investment in an unlisted company in two years or is, or has recently been, the director of a company with an annual turnover of at least £1m qualifies. Buying a few shares in a couple of football clubs would count for the first while owning corner shops would meet the second requirement – even if that ownership proved to be disastrous. So unscrupulous advisers help potential clients with this requirement – and then promote offshore schemes of unlimited complexity (and ultra high commission). Another rule – is that once someone has bought into a UCIS, they are then considered to be sophisticated enough to buy into others. This could mean that someone in a property scheme could then be sold a film production plan, even if most property experts know little about cinema financing. There’s another wonderful piece of circularity. Investors have to sign an agreement that they understand they will lose certain rights including coverage by the Financial Services Compensation Scheme. But they also have to agree that “I am aware that it is open to me to seek advice from someone who specialises in advising on this kind of investment.” This could lead them to taking advice from the very adviser who is promoting the scheme. The new rules will simply ban the promotion of all UCIS but not Venture Capital Trusts and Real Estate Investment Trusts. UCIS promoters will have at least a year to assimilate the ban – for some reason the regulators buy into the “difficult to change our business model” line. But – here is a debate on how far you can protect people from themselves – the prohibition does not include overseas advisers targeting UK investors. Unless the final document has a surprise, it will accept no one can effectively protect investors from all UCIS promotion. The best way to do this would be changing the SIPP investment rules. For as long as the tax regulations allow almost anything, then it will still be a case of anything goes. You have been warned though not by many UCIS providers of course. I conclude that anyone whose only, or primary, concern in the independence debate is the economic impact on Scotland might as well toss a coin or stay at home on polling day. An interesting analysis however I am always disappointed that the arguments for or against independence is a financial argument. I can’t think of another country that has fought for independence who gave any thought as to what currency they would have or if they would be a bit better or worse off. Independence is a MUCH bigger issue and I believe that the Scots should put all this to one side and simply decide – do they want to be independent? In is in the interest of Scotland and England to sort everything out amicably afterwards. I would rather have an independent Scotland as a happy neighbour than an disgruntled Scotland that only voted to stay with us for financial reasons. Well said Pavlaki,although,one could argue that the English/Welsh/Irish should be allowed a say on whether they want an independent Scotland as well. 1) Why would last year have seen a record level of investment in our oil industry if it was felt that prices, and hence revenues were likely to decline? 3) The IFS is pro-Union, and circulated similar scare stories around devolution. 4) The seas around our coasts, including the North Sea will be split geographically, according to International law, which will give Scotland 95% of those resources. It’s not a matter for negotiation. 5) In the speech in Edinburgh, where Gideot “ruled out” a currency union, he also accepted rUK responsibility for ALL UK debt. What is to be negotiated, is Scotland’s share of non-geographic assets in RETURN for assuming a proportion of that debt. 6) There has been a decade’s supply of North-Sea oil left for 35 years. 7) Scotland is a huge net exporter of energy without oil. Nick MacPherson’s view of Currency Union? Point two is especially apposite I think. 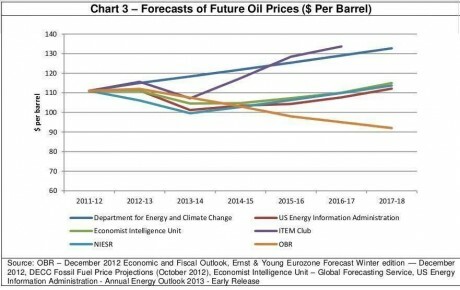 A more up to date version of the DECC forecasts can be seen below but its central oil price forecast rises every year. Thus we get gentle rises taking us to US $119.7 per barrel in 2020 and US $127.1 in 2025. Robert Chote shows that a tame IFS can have its rewards. Actually Forbin new supplies have materialised, but in US not in Scotland. $100 oil has fuelled the truly gigantic drilling effort to extract tight-oil in the US. There are tens of thousands of drilling rigs that wouldn’t be there without $100 oil – each rig sucking up tiny quantities of oil compared to the old style gushers we are more familiar with. They are literally lighting up the night sky in in the western deserts of Texas. Its added 3M barrles per day to US production – add in gas liquids from shale and ethanol (also booming with $100 oil) and US imports have dropped dramatically – which is good news for the rest of us – oil might be way above $100 otherwise. How long this immense effort lasts in another question…..
For Scotland their future depends on North Sea production – that much is clear. You can be an optimist or a pessimist but the facts are production has dropped from peak near 3M barrels per day to below 1M barrels per day in 14 years. But in same time oil price has gone from $25 to $110. There is maintenance every year, normally in summer months, short term oscillations aren’t relevant. Much of he North Sea infrastructure is 30+ years old and rusting – you can’t deploy thousands of nodding donkeys like you can in the deserts of Texas and North Dakota. Its also one of the most heavily explored basins in the world. But yes more deposits will be found, oil might rise to $200 – Scotland might even be better off – who knows ? There is a much higher chance of a Free Scotland than free popcorn! Although the corn price has had another dip to US $4.57 today. aye all this is true but the question becomes of how fast we get to $200 oil and what economic impact it has on the USA, the Western economies and Chinindia . As far as the economics of the North Sea in general goes , its expensive and we find smaller and smaller fields whilst decline relentlessy goes on in the old fields . As far as independence goes I have no doubts that Salmond will take the Scots into the euro as fast as he can – better to be the big boss of a country than a little boss of a region ! UKIP gain some momentum, get a little representation and the UK quits Europe. Popcorn sales go through the roof! !